Each slide has a drag and drop content area in which captions can be added. All our individual panels weigh only 15 pounds each and have all the benefits listed below to keep your horse safe and secure. Also it takes only one person when constructing the corral or loading the corral for traveling. Our panels are notched and welded for strength so they will ast for many years versus panels that expand until your horse lightly bends one and the panel will no longer open or close anymore. Our panels are galvanized steel that will look the same for any years vs. painted or powder coated that can chip or scratch after several uses. Travel N Corrals feature portable panels that are very lightweight and easy to assemble. We have taken great care and testing to insure the construction of the panels and the assembly mechanisms to interlock the panels to make spacious corrals that are safe and comfortable for your horse. Our Travel N Corrals panels are guaranteed with a material and workmanship warranty for Life as long as the original owner has them. While Travel N Corrals are constructed with strength in mind, they are intended for use with tame, broke horses. 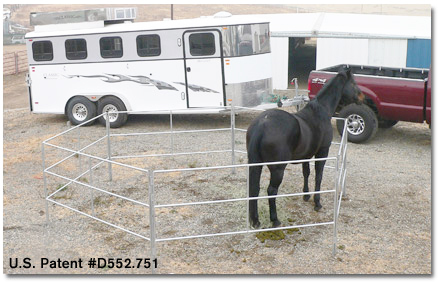 Corrals are not constructed to be used with unbroken horses, unruly horses, wild horses, or cattle. Our corrals are built to give your horse safe and lasting use, while offering you the lowest cost per corral in the market, backed up with a life time guarantee. Join our list of life time customers and own the greatest corrals ever constructed. 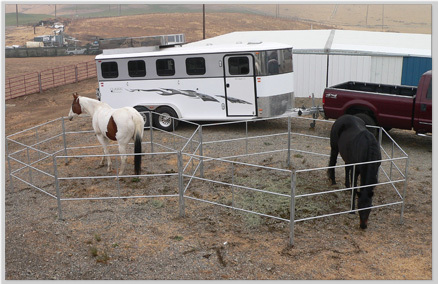 The lightweight Travel N Corral panels will allow you to build a 13’ x 13’ round horse stall right next to your trailer in less than 15 minutes. Panels are 7.0’ long and 4.0’ high. All joints are welded for strength. Panels interlock at every joint with a 4.0’ long rods. Panels are built from 1" galavanized round steel tubing for durability. Wherever panels interlock can become a gate. For the horse that needs more room. Individual panels are 7.0' long and 4.0' high and built from 1" galvanized round steel tubing. Each panel interlocks together with a 4.0' long pins to make the total corral secure and strong enough to corral even a very large horse. Where any 2 panels come together and interlock with the 4.0' long pin can simply become a gate by just pulling the pin. 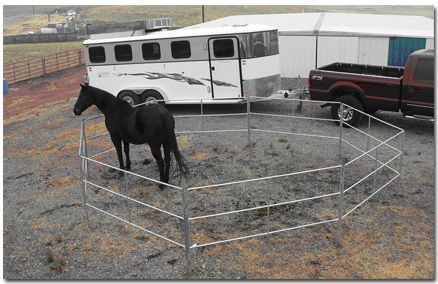 The lightweight Travel N Corral panels will allow you to build two 13’ x 13’ round corrals attached together. Should you be in need of more corrals than just this double set you can add additional 13' x 13' round corrals to this double set. Searching for the best portable corrals on the market? Our panels are notched and welded for strength so they will last for many years versus panels that expand until your horse slightly bends one and the panel will no longer open or close anymore. Our connectors are notched and welded for strength, vs. nuts and bolts or panels that expand until your horse slightly bends one. Our panels are connected every 7’ with a full length 4’ steel pipe rod that a horse cannot pull out vs. short pins or Velcro that the horse can work at removing. Our panels are galvanized steel that will look the same for many years vs. painted or powder coated that can chip or scratch after several uses. 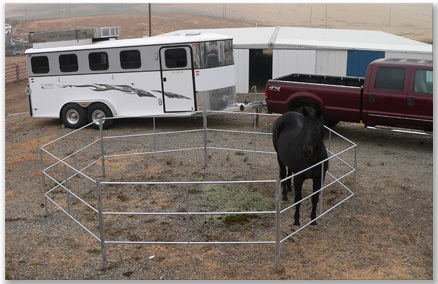 Corral size has proven to be a big factor when we conducted our safety testing and that’s why our corrals are the biggest being offered at 13’ x 13’ round so the horse can circle vs. others at 10’ x 10’ square that are just too small to leave a horse in for long periods. We also offer double corrals and portable corrals in larger sizes up to 18 x 18’, all with the same safety features described above. We’re confident our panels will hold up for many years-- that’s why they come with a life time guarantee for the original owner vs. other panels that come with a 30 day warranty. By Default, this Content Ready page uses an image called "home-slider-parallax.jpg"
To use your own image for this Parallax section you must replace the image. Once you have your image, upload it to weebly by going to: "Design > edit CSS/HTML > add new files"
will be displayed when you publish your site. NOTE: To ensure the parallax image displays correctly on larger screens it is advisable you use a large image. We have what we call panel boots that the panels rest in when they are mounted on either side of your dual wheels. In the picture you can see that these boots are mounted on the steps at either end of the fenders. This will not work on all trailers and it could block windows from being let down during travel, don't give up; we can work with you to solve your mounting challenges. We also have panels mounted inside trailer stalls and trailer tack rooms in many customer trailers. 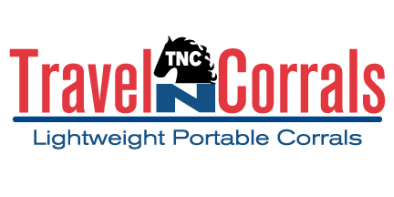 Contact Travel N Corrals directly and place your order.